Welcome to the NCEJN website! Tutman to speak at NCEJN’s 15th Annual Summit. 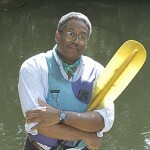 Fred Tutman, the Patuxent Riverkeeper, and the only African-American Riverkeeper, will give the keynote address at this year’s North Carolina Environmental Justice Summit. The 15th Annual Summit will take place on October 18th and 19th at the Franklinton Center at Bricks. You can access registration documents on this site. Find out more about Fred Tutman here.